Generally, water is the best fluid for your body, hell you’re made up of 75% of it! However, if you exercise for longer than an hour or in a hot/humid environment, you may need to supplement your hydration. In order to replace the carbohydrates used to fuel exercise and the electrolytes lost in sweat, sports drinks are optimal. They allow you to replenish your sources of vitamins, minerals, and carbohydrates. The additional nutrients will often stave off feelings of fatigue. It is also taste better than water (normally) and your body may crave something palatable after a long workout. Most sports drinks are high in sugars and contain smaller amounts of protein. Contrary to what most fitness magazines and bodybuilders will tell you, an optimal post-exercise drink is at a 3:1 carbohydrate to protein ratio. This is scientifically backed after years of research. If you look at the ingredients on most protein shakes and supplements, it is almost the complete opposite. As you replenish your body with sugars (glycogen in the body), it promotes protein synthesis (muscular growth). Keep this in mind next time you are looking for something to quench your thirst after exercising! We hope this post helps you be a bit more informed next time you ask yourself, “Should I drink sports drinks when I exercise? This post was written by Josh Cantor who holds a Master’s Degree in Exercise Physiology from the University of Miami. 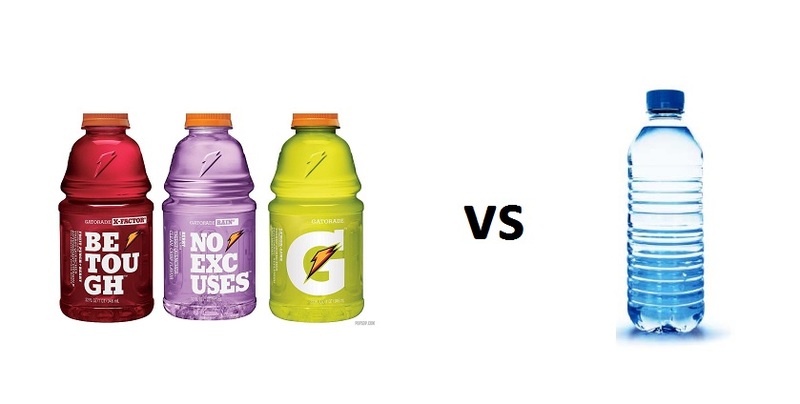 One Response to Should I Drink Sports Drinks When I Exercise?